What if you replied: “All good, but suovas tasted 1000 times better”, or “I liked herrings and salmon, but the Arctic char was really a surprise”? You have no idea what I’m talking about, do you? Well, these are just a few examples of what can be tasted in a meal at Knut. I’m not gonna reveal to you what suovas is, (you have to be brave enough to try it), but I’m going to tell you a bit more about the Knut restaurant. 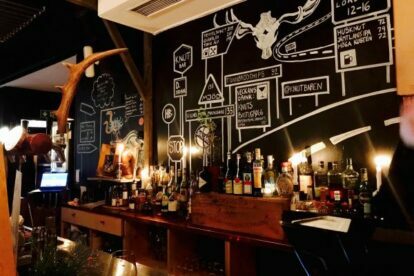 Knut is a cozy bar/restaurant close to T-Centralen; the style is without any doubt Nordic: intimate atmosphere, dim light, big wooden tables with benches, leathers over the seats and majestic moose heads as chandeliers. The cuisine is typical for the northern part of the Scandinavian peninsula (so not only Sweden): the food is in fact heavily influenced by the Sami culture, the native Indians of Scandinavia. If you are not into Scandinavian food, you can simply have a drink with Northern taste while enjoying the atmosphere, or go for the local version of pizza, the tunnbröd pizza, delicious and definitely something you can add to the list of unconventional food!